I once heard an accomplished backpacker say that the the only thing he wished he’d taken on his last trip was less. I’ve learned over the years that the less I carry on my back, the more I enjoy the journey, so my goal was to keep my Camino de Santiago packing list to a minimum. A light backpack, and my questionable commitment to endurance challenges, helped me cover the 537 miles (865 kilometers) of The French Way from Saint-Jean-Pied-de-Port, through Santiago de Compostela, to Cape Finisterre, in just 18 days. This isn’t a packing list just for people hiking 30 miles per day, and I don’t really even recommend that, but if you’re preparing for your own hike along the Camino de Santiago this packing list might be a starting point to carry less, and enjoy more. To read about my Camino de Santiago hike click HERE. I carried a small backpack with a built in rain cover and put everything in dry bags for water protection. During the day I wore a pair of swim trunks, dry-fit t-shirt, and trail running shoes. I had brown zip-off hiking pants and a nice button up short sleeve shirt for the evenings and the long pants are a must if you want to visit churches along the way. I also had an extra pair of shorts and t-shirt for sleeping and a pair of sandals to change into after hiking all day. For layers I had a very lightweight wind breaker, synthetic thermal jacket, and rain coat. My personal items included a silk sleeping bag liner, towel, sunscreen, sunglasses, hat, and toiletries. The technology items I carried were my laptop (I work as I travel), a digital camera, cell phone, external battery charger, headlamp, and plugs and adapters for everything. I didn’t carry much food or water since the trail passes through several towns each day. I had around 2 liters of water capacity, and typically had a few energy bars, a Snickers, and some trail mix. I found that I didn’t need the second pair of underwear or cotton t-shirt, though I did use both on the nights I slept in municipal albergues with no blankets. It was cold enough that I ended up sleeping in every layer I had and still shivered through the night. Sleeping Bag: Everything I read said that a sleeping bag liner would be sufficient, and it was for the private albergues, but in a few small towns my only option was the municipal albergues that offered disposable sheets but not blankets. Since I was hiking in October the nights were fairly cold and if I’d brought my summerlight sleeping bag (rated to 45°F or 7°C) I would have been more comfortable. I also could have saved a few euros each night and stayed in more municipal albergues rather than private albergues. Running Gaiters: Much of the Camino was dirt and gravel tracks and after a few hours my shoes would be full of stones and pebbles and I had to stop to empty them. If I’d brought my lightweight pair of Dirty Girl Gaiters I could have avoided most of the rocks in my shoes. Fleece Hat & Gloves: I keep doing adventures and leaving my hat and gloves at home, only to buy them again. After one cold and rainy day I stopped in town and fumbled for my wallet with frozen fingers to buy a pair of Quechua fleece gloves a size too large. They didn’t really fit, but I was happy to have warm hands again! I do freelance marketing work for a living and I didn’t want to put it on hold while hiking the Camino, so I brought my laptop with me. It isn’t a big heavy machine, but it did take up a surprisingly large volume of space in my 30 liter backpack. Without a laptop I may have been able to use a 25 liter pack, or, I could have opted to take my summerlight sleeping bag instead. Ultimately, everything I carried had a purpose and there wasn’t much that I took that I didn’t need. I hiked the trail fairly fast (averaging 30 miles per day) and I absolutely loved it. My favorite part was waking up early and hiking out alone in the dark to experience the quite solitude of each sunrise. I walked all day, only sat for lunch, and arrived in albergues late in the afternoon, just in time for dinner and bed. Most people wouldn’t find enjoyment in my style of hiking, and it wasn’t a great way to meet other pilgrims, but I personally got a lot out of my time alone. 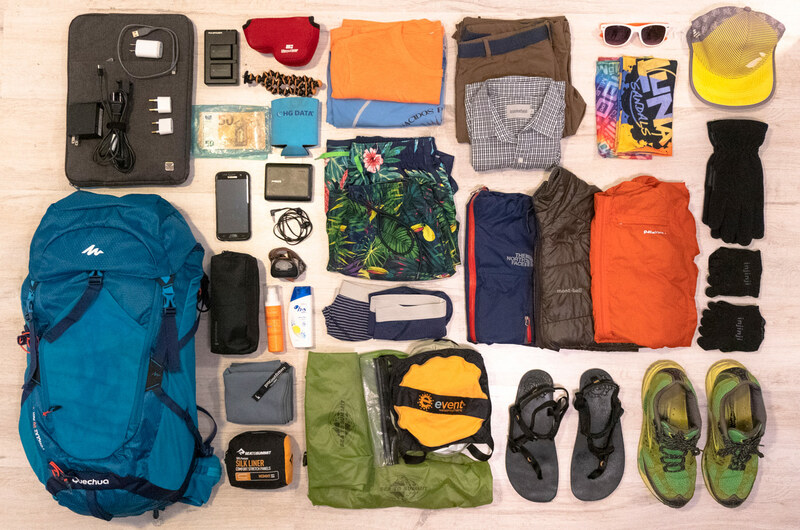 Regardless of your anticipated hiking pace, thinking critically about your gear list and packing as light as you’re comfortable with will help you enjoy your days on the trail, as well as your nights in albergues! If you have any questions feel free to ask me. Buen Camino! AFFILIATE DISCLOSURE: Many of the links above will give me a small commission if you buy something through one of my links (at no cost to you). I am participant in the Amazon Services LLC Associates Program, an affiliate advertising program designed to provide a means for sites to earn advertising fees by advertising and linking to Amazon.com. What did you record with? Your cellphone or a gopro type camera? Hey Jordi, I filmed with a Sony A6500. I bought it for the Camino hike and have really enjoyed it! Awesome stuff! You did an amazing job with your video and definitely have a new subscriber! I’ve been planning my own Camino de Santiago walk for a while now, and am a few months away and dialing things in more. I was just wondering if you know what your base weight was, round about? Keep up the amazing work! Thank you Tim! The Camino was an incredible experience, you’re going to really enjoy it! I wish I knew what my base weight was, the scale at the Pilgrim’s office where I checked in was busy and I didn’t hang around to get a chance to use it. I was relatively light, although I did have my laptop, power cable, and external hard drive with me for work, which added a few pounds. Also, I bought the backpack in Europe since I needed a second back to shuttle some things to the end and thought it would be better to carry a smaller pack. Ultimately though, my 3 lb, 50+ liter backpack that I carried on the Appalachian Trail several years ago would have been more comfortable than the new, smaller, and lighter pack that rubbed my hips and shoulders raw the first week or two. I typically try to stay as light as possible, but in that case I would have added a pound or two for added comfort! Buen Camnio!